Our Abpromise guarantee covers the use of ab43652 in the following tested applications. Nuclear phosphoprotein which forms a tight but non-covalently linked complex with the JUN/AP-1 transcription factor. In the heterodimer, FOS and JUN/AP-1 basic regions each seems to interact with symmetrical DNA half sites. On TGF-beta activation, forms a multimeric SMAD3/SMAD4/JUN/FOS complex at the AP1/SMAD-binding site to regulate TGF-beta-mediated signaling. Has a critical function in regulating the Has a critical function in regulating the development of cells destined to form and maintain the skeleton. It is thought to have an important role in signal transduction, cell proliferation and differentiation. Belongs to the bZIP family. Fos subfamily. Phosphorylated in the C-terminal upon stimulation by nerve growth factor (NGF) and epidermal growth factor (EGF). Phosphorylated, in vitro, by MAPK and RSK1. Phosphorylation on both Ser-362 and Ser-374 by MAPK1/2 and RSK1/2 leads to protein stabilization with phosphorylation on Ser-374 being the major site for protein stabilization on NGF stimulation. Phosphorylation on Ser-362 and Ser-374 primes further phosphorylations on Thr-325 and Thr-331 through promoting docking of MAPK to the DEF domain. Phosphorylation on Thr-232, induced by HA-RAS, activates the transcriptional activity and antagonizes sumoylation. Phosphorylation on Ser-362 by RSK2 in osteoblasts contributes to osteoblast transformation. Constitutively sumoylated by SUMO1, SUMO2 and SUMO3. Desumoylated by SENP2. Sumoylation requires heterodimerization with JUN and is enhanced by mitogen stimulation. Sumoylation inhibits the AP-1 transcriptional activity and is, itself, inhibited by Ras-activated phosphorylation on Thr-232. 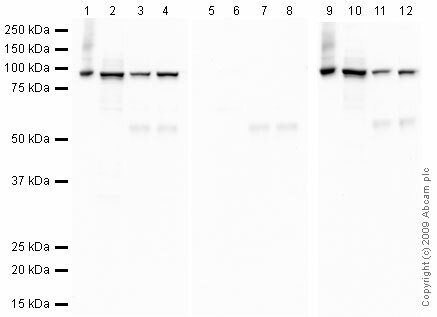 ab43175 detects a 95 kDa band in western blot. This is consistent with results obtained by other commercially available antibodies to this target, as c-Fos has been reported to dimerise with the c-Jun protein hence migration at a higher molecular weight than predicted. ab43652 has not yet been referenced specifically in any publications. Publishing research using ab43652? Please let us know so that we can cite the reference in this datasheet. There are currently no Customer reviews or Questions for ab43652.